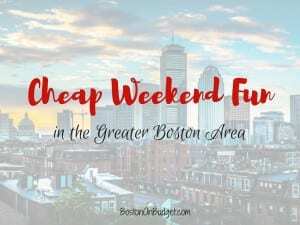 Cheap Weekend Fun in Boston for July 28-29, 2018! There’s so many fun and cheap things to do this weekend in Boston and beyond. As always, please let me know in the comments below if I missed any fun and free events in Boston! Figment Boston 2018: July 28-29, 2018. Enjoy a fun and creative weekend with Figment Boston with interactive art across the city. Cambridge Jazz Festival: Sunday, July 29, 2018 at Danehy Park from 12-6PM. Enjoy this annual event with Jazz music and more all day! Patriots Training Camp: July 26-29, 2018 at Gillette Stadium. Head down to Foxboro to watch the New England Patriots train for the upcoming season. Free and open to the public. Gates open at 8AM and practice is at 9:15AM. Shakespeare on the Common: July 18-August 5, 2018 at the Parkman Bandstand on the Boston Common. Enjoy a free performance of Richard III at 8PM and 7PM on Sunday nights. Magic 106.7 Family Film Festival: Every Saturday from July 7-August 25, 2018 starting at 6PM. Enjoy a free movie under the stars in the courtyard of the Prudential Center with a free screening of Wonder starting at dusk. Movies in the Park: Every Saturday from July 7-August 25, 2018 at Sylvester Baxter Park in Somerville. Head to Assembly Row for a free outdoor movie with a free screening of Cars 3 starting at dusk. Sunday Night Movie Night: Every Sunday night from July 22-August 26, 2018 at Christopher Columbus Park in the North End. Enjoy a free outdoor movie screening of Roman Holiday at dusk. ZUMIX Summer Concert Series: July 8-August 26, 2018 at Piers Park from 6-8PM. Bring a picnic and some friends and enjoy an evening of free live music! Tango in the Park: Every Saturday in July & August from 6:30-9:30PM at Rose Greenway Conservancy (across from Boston Harbor Hotel). Enjoy, dance, and delight in the magic of the Tango in the Park with free beginner lessons at 7:30PM.